Published on 3 July 2013. 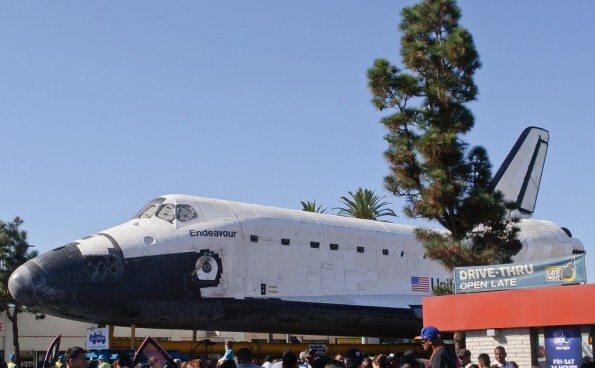 You might remember some of the extraordinary pictures from late last year, when the Endeavour space shuttle was driven across Los Angeles to its final resting place in a museum. It was a quite remarkable operation, and this Global Mail article by Gerard Wright describes it at a very human level. It also includes some more of those memorable photographs that really help to put the physical scale of the shuttle in perspective. But what if you like the space shuttle so much that you want to steal it? Jason Torchinsky has you covered with his article for Jalopnik. Torchinsky delivers an article on a faintly ridiculous topic in such a way that it combines eye-popping factual detail and intrigue with a strong dose of humour. It’s well worth a read. 2D posts appear on alternate Wednesdays. For 2D, I pick two interesting articles that look at an issue from two different – though not necessarily opposing – perspectives. I hope you enjoy them! The picture at the top of this post was uploaded to Flickr by InSapphoWeTrust, and has been used here under Creative Commons licence. This 2,035th post was filed under: 2D, Gerard Wright, Global Mail, Jalopnik, Jason Torchinsky.